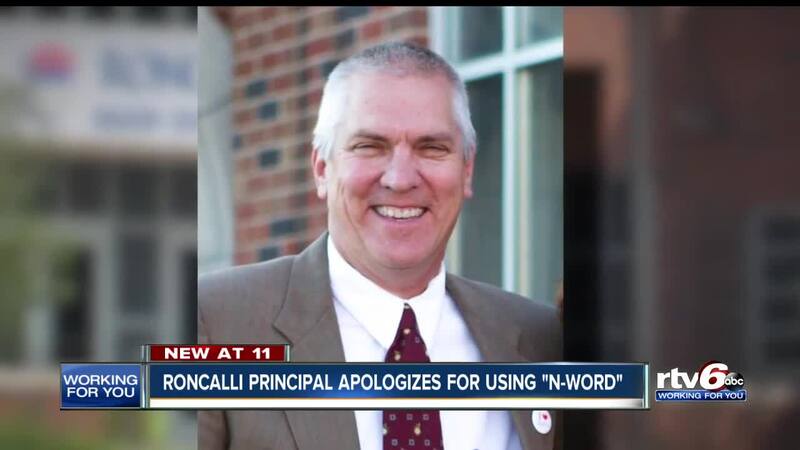 INDIANAPOLIS -- The principal of Roncalli High School in Indianapolis issued an apology Friday afternoon after he said he used a derogatory word during a school assembly. In an audio message sent to all parents of Roncalli High School students, Principal Chuck Weisenbach said he was explaining to students a list of words and phrases they should not tolerate and he unintentionally used the word instead of just referencing it. Read his full message to parents below. "Today, during an all-school assembly I made a significant mistake which I deeply regret. While discussing the importance of empathy with our students, I provided examples of words that should never be tolerated. Among the list of words and phrases was the N-word. I in no way used the word in a derogatory fashion, but instead to illustrate its ugliness. I sincerely apologize for the offense or hurt even hearing the word may have caused. As educators, we are often tasked with discussing uncomfortable matters, especially as it relates to race and discrimination. I am deeply sorry and in no way intended for my intent to educate our students to hurt anyone. I ask for your grace and forgiveness in this matter. Please know it's my total commitment and that of the entire Roncalli faculty and staff to building an inclusionary culture where all are welcome and belong. Please contact me if you would like to discuss this individually as I would welcome the chance to do so, thank you and God bless."